This is my first weekly overview post of the Analysis category at @utopian-io. The report aims to provide insight into the topics covered, the scores provided, staff picks (if any), and a look at how the current week has fared against recent weeks gone by. Any other work taking place and my personal thoughts in relation to the category will also be included. lokomotion's analysis on the usage of the 'Savings' feature in the Steem 'Wallet' concludes that this feature is used by < 20 of all accounts, and has more usage by smaller accounts. The reviewer suggests that larger accounts may prefer liquidity over security, as any savings take 72 hours to withdraw. This contribution scored well in all areas. paulag takes a look at the income of Bidbots in 2018 and reports that '26.21% of Curation Rewards claimed are paid to Bidbots' and 'on average for the year to date 19.01% of all Authors rewards claimed were sent to Bidbots'. She also presents the fall in Bidbot usage, but finds that ' 19.5% of all vests paid from the rewards pool (in 2018) ended up in the hands of Bidbot owners'. Much the same as the first contribution, this piece of work also scored well in each metric. miniature-tiger provides a monthly analysis on the state of play with regards to the dApps. This includes a look at the popularity of each app with regards to author, post counts and a focus on dApps showing good growth, and a look at new dApps arriving on the Steem blockchain. 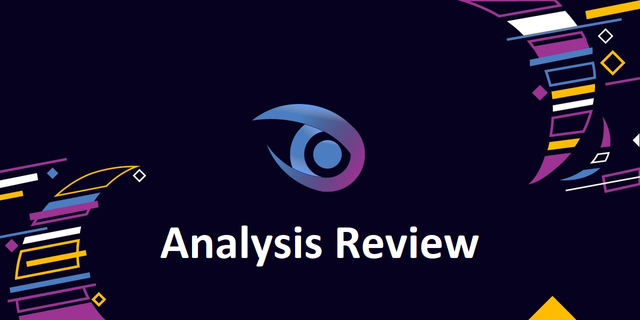 The reviewer wrote that 'while not necessarily needed for the distribution of the dapps, the analysis of the general posting and payout activity across the HF is a great addition to put the results into context'. Again, this contribution scored well in all of the assessment criteria. In summary, each contribution scored well and was given a mark between 74 and 79. All three contributions were 'based on a similar analysis' which likely prevented the totals from being higher. That said, all three were of a solid standard. The aim of this section is to represent the current weeks activity along with a recent set of data. Initially, this data has been collated from the previous 4 weeks (including this past week), but this data-set will grow as we move forward. An average score of 76.3 this week is almost 2% higher than the four week average of 74.7. Three contributions is equal to the four week average. 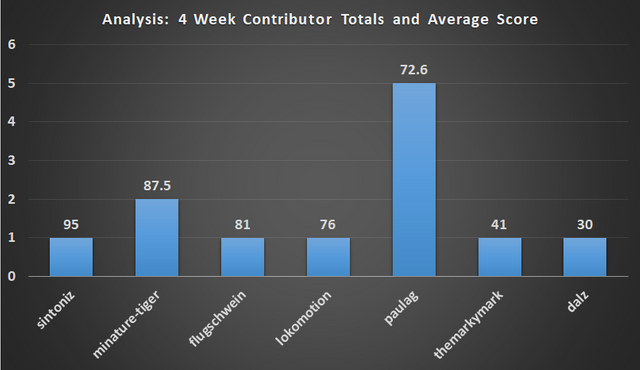 paulag heads the contributor table with 5 contributions over the past four weeks, but 4 contributors show a higher average score for their work. 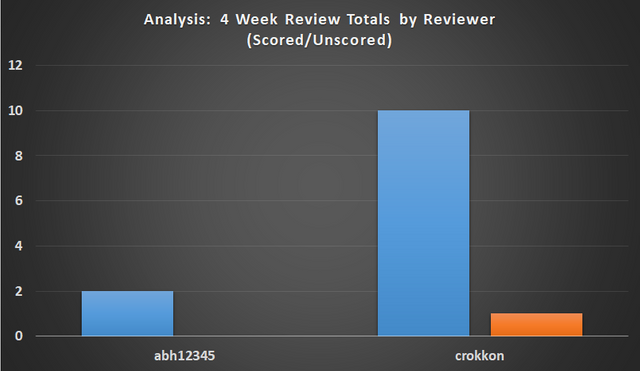 Two reviewers assessed all twelve contributions that received a score in the past four weeks, crokkon taking the lead on the only un-scored submission. 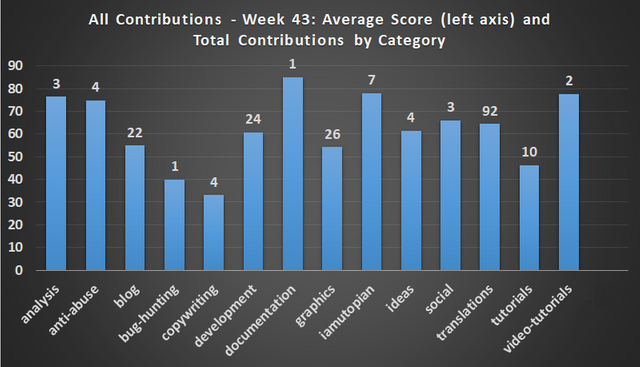 This final chart gives a weekly comparison of all the @utopian-io contribution categories. 9 categories received less than 10 contributions this week, and Analysis was one of those. 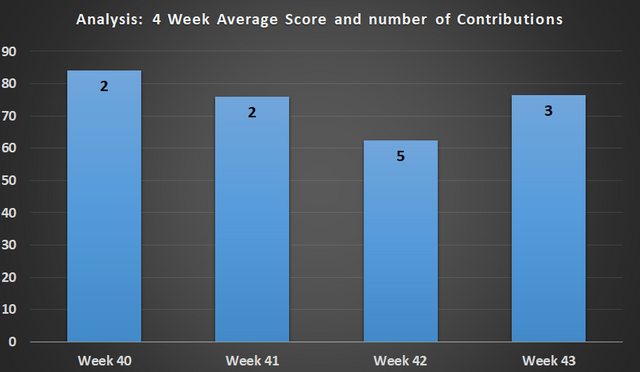 With an average contribution score of 76 for the week, Analysis was the 4th best scoring category. This is the first time I have used this 'agile' tool and I found it useful in keeping track of tasks. However, I suspect there will be minor edits to make to the document, both in the text and with regards to the amendments 'on the right hand side'. I think the document is readable by all, and so please take a look if you are interested in the updated guidelines for the category. When this work is completed and signed off, these guidelines will then feed into the task to update the reviewer questionnaire. I am looking forward to working on this and hope the output will give the moderators greater flexibility when scoring contributions. In less than two weeks, I will be attending Steemfest 3, and hope to meet more of the @utopian-io team. This is an excellent first weekly post for your category. The relatively low volume of posts allows you to address each post in the summary, which is nice. The graphs are both handsome and informative. Well done! Thanks for the feedback. It's true that whilst the numbers are low, I can make the effort to give a short review on each contribution, I hope that in time the category grows again but think that if this is the case, I'll not have the time to give them all a short write-up. Then I can focus a bit more on some of the data metrics, but hopefully there will be a good mix of text/charts in the report each week. These would all be Steem based and related to the blockchain where the user base overlaps. I would like to see analyses for projects that do not necessarily store data on the Steem blockchain. Yes they would, but plenty of interesting new topics to explore. I did think about a possible bonus question to the Analysis questionnaire, for a little extra reward for going further than the Steem blockchain. Do you have anything you'd like some eyes on? @Steemitblog is looking for some good writers who can write good content about the technical aspect....i thought to share your name but its better to ask first...so shall i? You can put my name down if you like though! Very succinct and insightful coverage, thanks! Your UA account score is currently 6.690 which ranks you at #121 across all Steem accounts. In our last Algorithmic Curation Round, consisting of 275 contributions, your post is ranked at #17. You got a 17.71% upvote from @ocdb courtesy of @abh12345! Did you know that 4.50% from the upvote value of this post goes to.... I would guess utopian-io. Cause I can't imagine anyone else that would get this. That's most likely then the curation fee being deducted. But you did that yourself? I wasn't familiar with this phenomenon until today. But I now learned that 10% of actifit rewards goes to the actifit account. Since I saw the 4.5% benificary for your utopian-io posts I figured that utopian-io claims a small part of the upvote value. But this is something you did? Can I also wonder who receives it? And why? Or am I being too nosy then?